Charles Luk (1898-1978) taught Daoist meditation techniques alongside (and integrated in) Ch’an Buddhist instruction decades before he finally finished, and then published ‘Taoist Yoga’ in 1970 in the UK, which is his English translation of Zhao Bichen’s meditation manual. He also wrote extensively about Daoist teachings to his numerous students around the world, and because of this interaction, included a section in his 1964 book entitled ‘The Secrets of Chinese Meditation’, chapter called ‘Self-cultivation according to the Taoist School’. This was six years before Taoist Yoga, and it is interesting to witness Charles’ eclectic approach to the subject, whereby Qianfeng Daoism is not treated in isolation, but viewed as part and parcel of the broad Daoist approach to self-cultivation. This is demonstrated by the next chapter in his 1964 book which is entitled ‘Authentic experiments with Buddhist and Taoist methods of self-cultivation’. Charles used published books as a type of mass media whereby he could write (or translate) definitive texts that anyone could access and make use of. As such, he was not interested in the pettiness of lineages, and never referred to himself as a ‘teacher’, although he obviously was. Not only was he an authentic Ch’an and Daoist teacher in his own right, but he had received permission to teach not only from Zhao Bichen (1860-1942) – the founder of Qianfeng Daoism – but also from Ch’an Master Xu Yun (1840-1959), as well as many others (including a Rinzai Japanese Zen master, and a Tibetan Lama). For Charles, certificates and transmission meant absolutely nothing, and he was not interested in their procurement. However, motivated entirely by the Buddhist notions of compassion and loving kindness, he instructed anyone who approached him, providing they respected the master – student relationship for the duration of the interaction. As a consequence, his numerous books are comprised of the essence of much of his correspondence (and personal instruction), edited and elaborated upon as a means to spread practical insight and wisdom as far as possible. The point of this activity was rooted in the fact that the vast majority of individuals in the world – that is ordinary beings – probably do not have access to genuine or effective self-cultivation knowledge, and are not likely to know any living saints, or masters to whom they can approach for instruction. Although Daoist anatomy and physiology theory can appear complex and highly specialised, Charles Luk emphasised the transformation of mind as the key aspect of his teaching method. He stated that this was how Zhao Bichen sometimes taught his students, and how he was advised (by Zhao) to develop an international Qianfeng studentship, but not in a manner that involved bureaucratic (and politically minded) organisations. 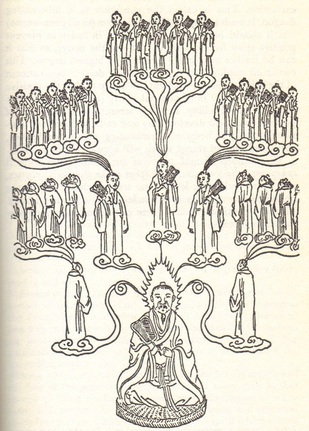 Rather, as the Wu Liu School of Daoism clearly taught, (Wu Liu was the precursor to Qianfeng, and the actual lineage Zhao Bichen trained within), the empty mind ground of Ch’an (which can be cultivated anywhere), should be emphasised to students spread throughout the world, augmented with personal written communication between each individual and Charles Luk. It was during this personal interaction that Charles Luk would ‘clear away’ confusions and blockages on the path for students who already practiced effective Ch’an meditation within a Daoist context, and who had access to The Secrets of Chinese Meditation, and Taoist Yoga. It is an interesting fact that this also often included men and women who were already training in other schools of Buddhist and Daoist self-cultivation, as well as atheists Hindus, Muslims and Christians, etc. In many ways the idea of a world-wide network of Qianfeng students linked by published books and letter-writing, was a prototype for the modern internet of today, where printed books can be easily accessible through digitisation, and where emails have replaced envelops and stamps. International communication has now become more or less instantaneous. Therefore the Qianfeng technique as viewed from the perspective of Charles Luk, is that the Buddha’s method is essential to transform the insight of Laozi to a higher level. What Laozi’s method acknowledges and represents (other than a cultivated awareness of the Dao), is a medicalised path of health development and sustainment (which is very much a specialisation of Master Zhao Ming Wang [b. 1966] of Beijing – the great grandson of Zhao Bichen in Beijing). This medicalised Daoism is as complex and intimate as a visit to the doctor – as it requires face to face communication. Needless to say, this important part of the Qianfeng tradition was not emphasised by Charles Luk (although he knew it through the personal experience of self-healing), as the insistence upon a ‘face to face’ teaching method would have undermined the premise of an ‘international’ drive to popularise Qianfeng. However, although Daoist masters (like medical doctors) can cure innumerable ailments and illnesses in the minds and bodies of their disciples prior to their enlightenment, (and thus lengthen their life-spans), it is also true (both within both Daoist and Buddhist literature), that the practice of dedicated meditation also has the potential to regulate the body and heal illnesses and injuries, etc, and it is this emphasis that Charles Luk chose to extol. Seated meditation for as long as possible, per day, tailored to meet individual requirements. This should happen in the morning and evening, but if there are constrictions on time, the morning is better. Sit in the half or full lotus on a suitable cushion. The pelvic girdle should be flat to the floor, so that the spinal column takes its natural anatomical position (of many convex and concave curvatures). The shoulder girdle should sit squarely over the pelvic girdle so that there is no leaning forward, back, or to the sides of the centre-line. The neck is gently extended by placing the chin slightly forward, and slightly down – this aligns the structure of the head upon the shoulders. The neck and shoulders should be relaxed so that the arms ‘hang’ in the joints with the hands resting lightly on the lap. The position of the hands can be either the left-hand resting on the palm of the right-hand with thumb-tips touching (which is typical of Ch’an Buddhist meditation with the variant of the hand position being the other way around if required), or in the typical ‘Qianfeng’ position of the left-hand lying in the right-palm, with the right-thumb gently pressing into the centre of the left-palm, and the left-thumb-tip touching the tip of the left index finger (see here). Eyes should be closed to avoid distractions, but some practitioners prefer the eyes to be slightly open. Breathing is deep, rhythmical, and slow. The breath enters the nose fills-up the abdominal and chest areas fully, before being slowly expelled also through the nose. Awareness of every part of the breathing cycle is crucial as a method of withdrawing the attention of the mind from the outer world and toward the inner world. Qianfeng practitioners directed by Charles Luk usually use a hua tou such as ‘Who is cultivating qi?’, or ‘Who is cultivating health?’, or some such variant depending upon individual need. The musculature must be completely relaxed so that all the bones and joints are aligned and self-supportive. Muscular tension is blocked qi, and blocked qi leads to illness in the body and continued confusion in the mind.